Amid a gathering of other current and former Spaatz award cadets, former CAP National Commander Brigadier General Richard L. Anderson recently awarded the General Carl A. Spaatz Award to two Maryland Wing cadets. On January 19th, CAP members from as far away as Delaware and Virginia traveled to honor these cadets at the St. Mary’s Composite Squadron, based at Naval Air Station Patuxent River, Maryland. 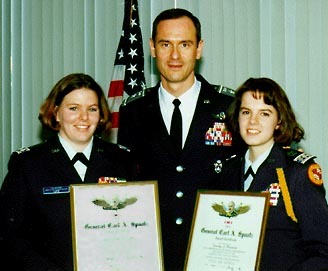 Cadet Colonels Tammy Blevins and Gabrielle Lutz, both members of the squadron, received the second and third Spaatz Awards in the history of this southern Maryland Wing unit. Cadet Colonel Blevins is an Aerospace Engineering major at the University of Maryland, College Park. Cadet Colonel Lutz is a Theater major at Towson State Universit. After joining CAP in 1991, they progressed together through the program, completing the Curry Achievement at the same time, attending encampment together, and serving together on numerous activities throughout Maryland Wing and Middle East Region. C/Col Blevins is currently the National Cadet Advisory Council Chair and attended IACE to C/Col Lutz attended IACE to Austria in 1996. Both are past chairs of the Maryland Wing CAC. Both have avidly supported CAP with public speaking presentations to many outside organizations ranging from aerospace presentations for elementary school children to CAP briefs for senior education officials. The eleven current and former Spaatz cadets present at the ceremony included General Anderson as well as other active duty and CAP officers. Distinguished guests included Col Bob Vawter, Delaware Wing Commander; Capt Brian Campbell, Delaware Wing Vice Commander; Lt Col Larry Trick, Maryland Wing Vice Commander; Lt Col James Steinmeier, Maryland Wing Chief of Staff; and Lt Col Bill Thomas, Middle East Region Photographer. Spaatz awardees attending the ceremony: Brig Gen Anderson, Capt Bob Midkiff, Capt Brian Campbell, C/Col Brian Coats, Capt Sean Fry, CDR Mark Swaney, USN, Capt Randy Allen, Lt Col Larry Trick and Capt Kevin Cooley.